Best reader in her class. David Ferrall, proud Dad, sent me a picture of my penpal Cate’s “win” — she read the most minutes of anyone in her class and raised the most money. I contributed — don’t remember how much — to advance her cause. David thoughtfully snapped a picture of it so I could share in the joy. This was a reading initiative in New York City… designed to motivate K-6 readers to bury their heads in their books. 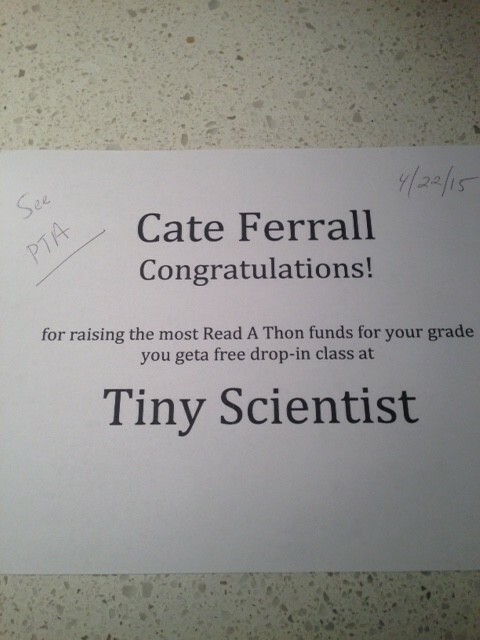 I’m not sure what a “Tiny Scientist” class is, but I hope Cate likes it!